Drink: Terra Barossa 2008 Shiraz Cabernet Petit Verdot | CookDrinkFeast! I like my wines to have junk in the trunk. I am determined to make that a oenological term. By ‘junk in the trunk’ I mean a red wine that is full-bodied and substantial. The Terra Barossa Shiraz Cabernet Petit Verdot definitely qualifies as a wine with junk in the trunk. It is an inky deep purple in the glass. The nose yields blackberries, chocolate, tobacco, and a hint of anise. The palate yields black fruit, chocolate, and a hint of tobacco. It is slightly ‘hot’ with alcohol. To me, this wine is like a warm blanket on a cold winter’s day. 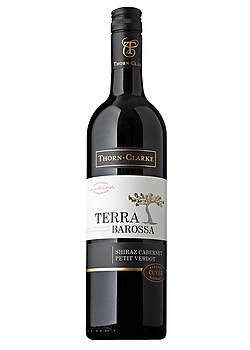 Terra Barossa’s 2008 Shiraz Cabernet Petit Verdot blend is full-bodied and fruit heavy. I found it to be beautiful, comforting, and delicious. Serve it with Chipotle Rubbed Pork Loin or Steak.